Prices are per room including breakfast and all taxes. Extra bed possible for a fee. Cesky Krumlov Hotel Peregrin is newly opened, family run hotel in the center of historical town – just a few steps from the main square. All imortant historical sights are within walking distance. Building of Gothic origin from the 15th century was many time reconstructed. It offers very nice views of Cesky Krumlov Castle and roofs of neighbouring houses. Design wallpapers by Cole & Son and other amenities like Italian chairs, wooden floors and doors or Czech artworks are important features. There is garden in the courtyard of Peregrin hotel. You can sit there not only for tasting of good wine while looking at the panorama of Cesky Krumlov Castle. Wifi internet is available free of charge. There is total 10 bright rooms in Cesky Krumlov Peregrin hotel. Each room has unique design, adapted to historical building layout. Each room has private bathroom (tube or shower) with toilet, table with chairs, Sat TV. Some rooms have view of the Castle. 1 room on the ground florr has been adapted wheel chair accessible! Parking is available about 500 meters from the boutique style hotel Peregrin in Cesky Krumlov. For late check in (after 18:00), it is necessary to contact front desk in advance (which is opened untill 20:00). Originally one storied building was build in 15th century. Gothic window has been preserved from this period. It was reconstructed in 17th century and than again in 18th century (due to fire). Another fire came in 19th century and at the start of 20th century was added 2nd floor. There is nice smooth facade and romantic prampouch vaulted over narrow street. Burgher, than cooker, shoemaker, butchers, carpenters, goldsmith, draper, butchers again and finally burghers were inhabitants over the time. 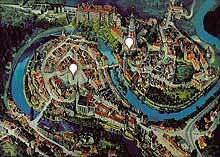 Above mentioned distances to main Krumlov tourist sights and important locations are exact as the crow flies. Please note that walking distance can vary. We recommend to check the locality on our detailed map of Cesky Krumlov to get definite insight. small hotel with elegant and spacious rooms, in the very center of Cesky Krumlov. Nice views from the terrace and rooms. Small family hotel on the bank of the river with romantic rooms in style of Ludvik XIV. and nice views of the Castle. one of the smallest guest houses in the very historical center of Cesky Krumlov. Each room has antique farniture, wi-fi connection and view of the Castle. How to book / reserve online? How do you know your reservation is confirmed/OK? Who is Charming Krumlov Hotels?